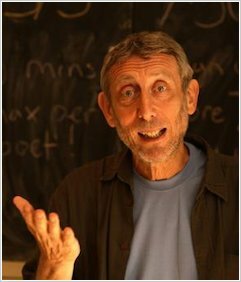 Michael Rosen grew up in the London suburb of Pinner. His parents were teachers, politically committed (socialists), and great storytellers and readers. I was lucky to have found them. Michael is a writer, teacher (of sorts), journalist, performer and broadcaster. He also visits lots of schools doing my one-man show, and support Arsenal Football Club. He is best known for classic books like We’re Going on a Bear Hunt, and was Children’s Laureate from 2007-2009. Michael won the Nestle Smarties prize for We’re Going On a Bear Hunt. He was awarded the Eleanor Farjeon prize for services to Children’s literature in 1997, and was Children’s Laureate from 2007-2009.